Bhimrao Ramji Ambedkar (1891–1956), one of India’s foremost revolutionaries, grew up untouchable. Battling against the odds, he gained multiple doctorates, campaigned against social discrimination and the caste system and went on to draft the Constitution of India. Throughout his life Ambedkar faced routine discrimination: in school at the age of 10; in Baroda after his return from Columbia University; and while travelling in later life. The discrimination experienced by Ambedkar continues to haunt a majority of India’s 170 million dalits as many are still denied water, shelter and the basic dignities of life. In this ground-breaking work, Pardhan-Gond artists Durgabai Vyam and Subhash Vyam interweave historical events with contemporary incidents, infusing fresh energy into the graphic idiom through their magical art. Durgabai Vyam, who has illustrated a dozen books and won the BolognaRagazzi award in 2008 for The Night Life of Trees, says Bhimayana is her most accomplished work yet. Subhash Vyam began as a sculptor before turning to painting. They live in Bhopal, Madhya Pradesh. Srividya Natarajan is a dancer and novelist; she lives in London, Canada. S. Anand is the publisher of Navayana. “A graphic novel depicting a life that must have flashed meteor-like across the Indian sky in mid-twentieth century. 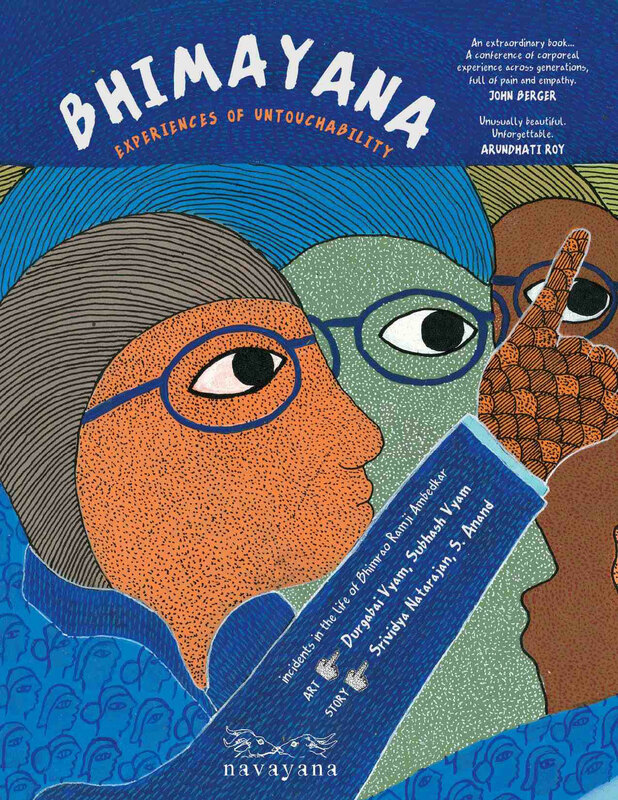 The story is told in a way that connects Ambedkar’s struggles and triumphs to events very much like the one I started with: violent attacks in our contemporary times, every day targeting Dalit bodies and Dalit homes or institutions with brutal assaults.”—Amitava Kumar in JJ books.